Sulfite oxidase deficiency is an inborn error of the metabolism of sulfated amino acids. Individuals affected with sulfite oxidase deficiency most commonly present in the neonatal period with intractable seizures, characteristic dysmorphic features, and profound intellectual disability. 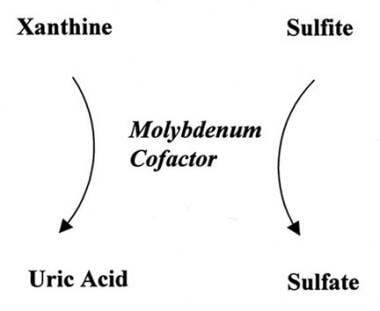 Molybdenum cofactor deficiency, which affects the functioning of sulfite oxidase, leads to a similar phenotype. As sulfite oxidase deficiency and molybdenum cofactor deficiency have virtually identical phenotypes, the CNS toxicity appears to be secondary to loss of function of sulfite oxidase. Methionine and cysteine normally are metabolized to sulfite and then are oxidized to sulfate by the enzyme sulfite oxidase (see the image below). Sulfite oxidase deficiency and molybdenum cofactor deficiency in the metabolism of sulfated amino acids. When sulfite oxidase is deficient, alternate metabolic pathways for sulfite are augmented, including formation of metabolites s-sulfocysteine and thiosulfate. S-sulfocysteine probably substitutes for cysteine in connective tissues. This substitution appears to weaken the zonule of the lens (a tissue normally rich in cysteine) and results in the characteristic dislocated lenses. The pathogenesis of the brain damage in those with sulfite oxidase deficiency is not known but may be related to sulfite accumulation or lack of sulfate in the CNS. The frequencies of sulfite oxidase deficiency and molybdenum cofactor deficiency are unknown; however, these disorders are probably underdiagnosed. In most cases, sulfite oxidase deficiency is fatal in infancy or early childhood. Survivors of sulfite oxidase deficiency often have profound intellectual disability. Some later-onset cases with more favorable outcomes have been reported. Of note, some types of molybdenum cofactor deficiency have been responsive to treatment, leading to better longer-term outcomes. Molybdenum cofactor deficiency and sulfite oxidase deficiency are panethnic. Traditionally, infants with sulfite oxidase deficiency were reported to present in the neonatal period. However, an increasing number of patients have been reported with later onset or deterioration after an intercurrent illness. Most cases of sulfite oxidase deficiency are fatal in infancy or early childhood. The prognosis may be more variable for later-onset cases. Survivors of this disorder often have profound intellectual disability. Some later-onset cases with more favorable outcomes have been reported. Of note, some types of molybdenum cofactor deficiency have been responsive to treatment, leading to better longer-term outcomes. Individuals with molybdenum cofactor deficiency type A who are eligible for and treated early with cPMP replacement may have a better prognosis. Sulfite oxidase deficiency is inherited in an autosomal-recessive manner. Two parents who are both carriers of pathogenic variants have a 25% recurrence risk for sulfite oxidase deficiency in future children. Genetic counseling is encouraged, including information about prenatal and preimplantation diagnosis to parents of individuals with this disorder. Cho SY, Goh DL, Lau KC, Ong HT, Lam CW. Microarray analysis unmasked paternal uniparental disomy of chromosome 12 in a patient with isolated sulfite oxidase deficiency. Clin Chim Acta. 2013 Nov 15. 426:13-7. [Medline]. Tan WH, Eichler FS, Hoda S, et al. Isolated sulfite oxidase deficiency: a case report with a novel mutation and review of the literature. Pediatrics. 2005 Sep. 116(3):757-66. [Medline]. Johnson-Winters K, Tollin G, Enemark JH. Elucidating the catalytic mechanism of sulfite oxidizing enzymes using structural, spectroscopic, and kinetic analyses. Biochemistry. 2010 Aug 31. 49(34):7242-54. [Medline]. [Full Text]. Claerhout H, Witters P, Régal L, Jansen K, Van Hoestenberghe MR, Breckpot J, et al. Isolated sulfite oxidase deficiency. J Inherit Metab Dis. 2018 Jan. 41 (1):101-108. [Medline]. Zaki MS, Selim L, El-Bassyouni HT, Issa MY, Mahmoud I, Ismail S, et al. Molybdenum cofactor and isolated sulphite oxidase deficiencies: Clinical and molecular spectrum among Egyptian patients. Eur J Paediatr Neurol. 2016 Sep. 20 (5):714-22. [Medline]. Westerlinck H, Meylaerts L, Van Hoestenberghe MR, Rossi A. Sulfite oxidase deficiency in a newborn. JBR-BTR. 2014 Mar-Apr. 97(2):113-4. [Medline]. Bosley TM, Alorainy IA, Oystreck DT, Hellani AM, Seidahmed MZ, Osman Mel F, et al. Neurologic injury in isolated sulfite oxidase deficiency. Can J Neurol Sci. 2014 Jan. 41(1):42-8. [Medline]. Bindu PS, Christopher R, Mahadevan A, Bharath RD. Clinical and imaging observations in isolated sulfite oxidase deficiency. J Child Neurol. 2011 Aug. 26(8):1036-40. [Medline]. Hoffmann C, Ben-Zeev B, Anikster Y, et al. Magnetic resonance imaging and magnetic resonance spectroscopy in isolated sulfite oxidase deficiency. J Child Neurol. 2007 Oct. 22(10):1214-21. [Medline]. Veldman A, Santamaria-Araujo JA, Sollazzo S, Pitt J, Gianello R, Yaplito-Lee J, et al. Successful treatment of molybdenum cofactor deficiency type A with cPMP. Pediatrics. 2010 May. 125 (5):e1249-54. [Medline]. Arnold GL, Greene CL, Stout JP, Goodman SI. Molybdenum cofactor deficiency. J Pediatr. 1993 Oct. 123(4):595-8. [Medline]. Holder JL Jr, Agadi S, Reese W, Rehder C, Quach MM. Infantile spasms and hyperekplexia associated with isolated sulfite oxidase deficiency. JAMA Neurol. 2014 Jun. 71(6):782-4. [Medline]. Johnson JL. Prenatal diagnosis of molybdenum cofactor deficiency and isolated sulfite oxidase deficiency. Prenat Diagn. 2003 Jan. 23(1):6-8. [Medline]. Johnson JL, Wadman SK. Molybdenum cofactor deficiency and isolated sulfite oxidase deficiency. The Metabolic and Molecular Bases of Inherited Disease. 2nd ed. 1995. 2271-86. Kucukatay V, Savcioglu F, Hacioglu G, et al. Effect of sulfite on cognitive functions in normal and sulfite oxidase deficient rats. Neurotoxicol Teratol. 2005. 27:47-54. [Medline]. Simmonds HA, Hoffmann GF, Perignon JL, et al. Diagnosis of molybdenum cofactor deficiency. Lancet. 1999 Feb 20. 353(9153):675. [Medline]. Waring WS, Maxwell S. Diagnosis of molybdenum cofactor deficiency. Lancet. 1999 Feb 20. 353(9153):675-6. [Medline]. Del Rizzo M, Burlina AP, Sass JO, Beermann F, Zanco C, Cazzorla C, et al. Metabolic stroke in a late-onset form of isolated sulfite oxidase deficiency. Mol Genet Metab. 2013 Apr. 108 (4):263-6. [Medline]. Pictured is an infant with sulfite oxidase deficiency. Note the narrow bifrontal diameter and deep-set eyes.